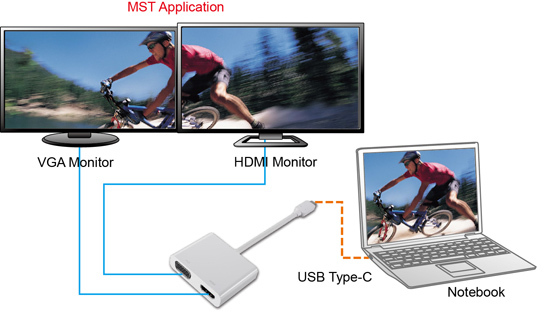 The USB-C to Dual-Display Adapter is designed for connecting a USB-C embedded device (laptop, desktop and etc.) that also supports ALT mode to a VGA or HDMI embedded device (television, monitor and etc.). If the system supports MST function and then MST display output mode is available. 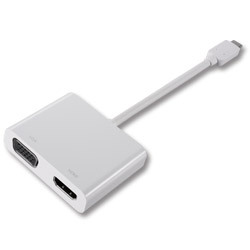 This adapter’s HDMI output resolution is up to 3840x2160@30Hz and VGA output resolution is up to 1920x1200@60Hz. No need to install extra drivers, just plug and play. You can charge your PC by inserting the power adapter came with your PC into the USB-C connector and process data link via USB 3.0 Type-A connector at the same time. Please fill out the following information and submit your question to us.